This was a relatively tame year for road tripping, for me. The One Big Road Trip never really materialized, only a Pittsburgh --> Indianapolis --> Louisville --> Cincinnati --> Pittsburgh round trip over Labor Day weekend. I did manage to continue my habit of taking unnecessarily long routes to and from intermediate destinations (Pittsburgh to DC via Johnstown and Morrisons Cove, DC to Pittsburgh via U.S. 50 and WV 28, returning home from Allentown via the heart of the Coal Region), and towards the end of the year I also upped my impromptu day trip game which is something I will look to continue into the new year. Only 15 new counties per mob-rule (though if the weather holds I will try to knock off a few counties in Ohio one of the days after Christmas), so overall not a particularly expansive year. One can do that in Springfield? Wasn't aware of that. Along the way, I got Hunterdon and Cumberland counties, the two that I was missing for NJ, so I've now clinched all 21 counties in the state. I'm also going on a Central Jersey loop tomorrow that will cover parts of the Delaware River Valley and the Jersey Shore. Mid April: Forests of Northwestern Soria province. I got a section of A-15 on the way back, it would have been difficult for me to get it otherwise. Early August: Bordeaux, France. The only one I didn't drove but instead I was the GPS ( ), I clinched some additional French autoroute mileage. This was the second Northernmost point I've ever reached. Late October: Rioja. Once again, I got to clinch a hard-to-get-for-me-due-to-being-transversal-as-I-see-it route, N-111 between Soria and Logroño. Mid November: Teruel province. I'm sure the province exists, but it's not the same with the town. My longest trip was AR 530 from Pine Bluff to Star City, then US 425 and 165 to Monroe, coming home via US 80 and US 79. Was supposed to be two nights on the road, but turned into three. I just did a show in Kansas City a week ago and came home via MO 7 and 13 to Springfield, then old 66 to Joplin. I managed to locate most of old 13 south of Clinton. Those were my long trips. I've done several short trips around Arkansas and southern Missouri. Only one big trip this year, in October. Went back to RI with a side trip to Danbury, CT, which got me all counties in Connecticut (just BARELY got Tolland on the outbound leg). I also gained new mileage for I-84 and I-91 in CT along with I-90 in MA, plus finished a clinch of 95 in RI on the drive to Boston Logan (I flew there, connections via DCA both ways). I am one for traveling roads at daytime for pictures. Even though night driving is cool, for road geeking it is not so cool! If you ever go to Canada my advice for night driving is don't, especially if it is raining. The lines are not reflective at all and are barely visible at night when its dry. When it's raining you cannot see any lines period. Canada doesn't put reflectors in on their roads either. I would even stay off the freeways in big cities at night. It's that hard to see the dashed lines that divide the lanes. Funny story: My first mistake was entering Canada at 10 P.M. and expecting to find a cheap hotel in the next town over. The second mistake was thinking that the roads would be equal (as reflective) as the ones in the US. I felt like I was in a 3rd world country. The next town over is the funniest part. Towns are few and far between (a good 40 miles it felt like) in northern Ontario. Most are too small to have a hotel of any kind. Towns in those parts are a booming metropolis if they have a bank, gas station, and some kind of store. There is literally nothing but trees and forests. I ended up sleeping in a strip mall (3 or 4 businesses) gravel lot in some little town. My first night in Canada was sleeping in my car on a rainy night. I guess that is what happens when you drive on a 2000 km highway which has an average population density of 2 people per square mi (over the entire area of northern Ontario). The Prairies are similar, make sure you have lots of gas if you plan to travel at night. Most routes in southern Ontario have reflectors, again due to population density. ^ Or going up north after a particularly harsh winter before the lines have been re-striped. 1. Winter cabin fever trip (car, moteling) through NM, AZ, NV and CA. We stayed in Socorro NM, Tucson (with day trips), Yuma, Lake Havasu City, Bullhead City, San Diego, Phoenix and Albuquerque. Part of it was to revisit areas I traveled frequently with my parents (Lake Havasu). I saw Organ Pipe Cactus National Monument (on the Mexican border SW of Tucson) for the first time; spectacular vegetation. Interesting last leg of the trip - Albuquerque north to home on I-25 - involved the immediate aftermath of a winter storm that left snow the entire way. 2. Family visit by car to SE South Dakota, via Kansas and Nebraska. Then, I decided we should visit North Dakota, since I haven't been there for over 15 years. We stayed at Dickinson and drove through Theodore Roosevelt National Park. Then, we passed through Mt. Rushmore before heading home. Total states visited: KS, NE, SD, MN, ND, WY. 3. Took what turned out to be our last trip in our old travel trailer to the Monument Valley area. Over Wolf Creek Pass, through Cortez to Bluff, UT. Then, day trips and up to Moab, and finally stayed at Delta CO.
4. Not planned early in the year, but we replaced the travel trailer and took the new one on a week-long shakedown trip to Albuquerque and then to Bayfield CO, located between Durango and Pagosa Springs. 5. The last trip of the year was a 20th anniversary cruise that we took out of Galveston. We drove to Galveston, and instead of the direct route through Amarillo, Fort Worth and Houston, I picked a more westerly route through Abilene and College Station. On the return trip, we stopped in Fredericksburg, in the Hill Country west of Austin, then drove home from there through San Angelo and Clovis, NM. On this road trip, I clinched U.S. 290; the only major route clinch of the year. Also, I drove through what I think is the last county in New Mexico I hadn't been in, Harding. Oh, and the cruise took us to two new countries / territories. We had stops in Mexico (where I've been before), Cayman Islands and Jamaica. I didn't drive in those places, of course. 2015 was a good year for long cruises with my wife. Gray lines are my Mustang, Blue lines in my wife's. Basecamp says we did 9,751 miles worth of road trips this year, and reached 6,576 feet (parking area at Mount Mitchell). We basically wore out a groove in I-40 in both directions this year, including two back to back trips to the mountains within a week at the end of November, beginning of December. This was the year we finally did the length of Skyline Dr and the Blue Ridge Parkway together in one trip back in May (it took 2 days). Just this past weekend we did a day trip to Cape Hatteras and back. 2. Cincinnati/Northern Kentucky. I had never been to either before this. I took I-80 to I-65, then around the Indianapolis Beltway to US 52, IN-9 back to I-74 east until US 52 joined it. I took I-74 to Central Parkway (US 27/127 and maybe 52?) south to downtown Cincinnati. Took US 42/127 to Kentucky so I could add US 25 to the list of US routes I've been on. At the beginning of the year a road trip with a friend I have known for a long time, real long time, like since 1962 long time. He was drawn out on an Elk hunt in Colorado and I volunteered to go with him in case he needed help. He didn't need help as we only saw two elk. One almost ran into his pickup on the highway and one was dead in the back of a pickup. We had fun visiting people he knew when he worked out there. In May The Wife, daughter, and I road tripped to up state New York to visit historical places and enjoy the scenery plus attended her nephew's West Point graduation. Afterwards we toured around the northeastern states. Later in the summer The Wife and I went to Santa Fe to celebrate our wedding anniversary. Had to cancel two early motorcycle trips because of some unexpected issues. However, I did make a solo motorcycle/camping trip to southwest NM and southeast AZ in April. Then another motorcycle trip to northern NM with a buddy. In late July a solo motorcycle/camping trip to the northwest US before riding up to Hyder, AK then to Watson Lake, Yukon via the Cassiar, before heading down to Dawson Creek then up to Yellowknife, NT. In October a buddy and I made our annual motorcycle trip to Terlingua and Big Bend National Park. The day before Thanksgiving (returned Dec 1) my daughter and I took a motorcycle trip to south of Tampa, FL. Only one good trip this year. Flew to SLC, rented a car, and did a big circle in the northwest quadrant of the USA. Visited a bunch of NPS units (got past the halfway mark), clinched thousands of miles of highway (finished the interstates in Washington and Idaho, and almost finished Oregon, Utah, and Montana), and saw a few minor league baseball games. Besides that, just some small weekend trips around Florida, visiting all the home stadiums in the Florida State League (high A). Drove to Shreveport for a work trip, which let me clinch a bunch more of I-49 including the future segments down toward the New Orleans area, and US 84 heading back east. The only other trip of note was a week in Tokyo, but there wasn't a lot of roadgeeking other than the bus ride between downtown and the airport in Narita. The trip you took out of SLC is what I would call an awesome trip. No roadgeeking is OK. At least you got to go to Tokyo. In case anyone's interested, I just finished processing the pictures from my trip to Utah/Arizona/Nevada from October. May - Spontaneous trip up to Delaware/Ocean City (wife had to work and I had the rental car on Sunday). Drove the Bay Bridge Tunnel for the first time along with some other cool ones (Nice/Bay bridges). Also my first drive in Delaware. October - 10-day trip to see family in Dayton, OH, near Chicago, and near Owensboro, KY. Drove in Illinois, Michigan, and Alabama for the first time. Drove the Tail of the Dragon (US-129 at NC/TN border), that road is no joke. US-52 in WV as well, but otherwise stuck to Interstates/Parkways. Other than that, some minor drives around NC/VA. Bunch of state routes cilnched, along with I-485 (Ikea run this past weekend). I'm starting to run out of alternate routes to seeing my family back in Hickory. I've been on everything between US-158 and NC-24/27, and with a pregnant wife the longer trips are out of the picture for the time being. 1) As long as you actually crossed the river, you did officially add a small amount of mileage on US 25. US 25 is signed only to the Ohio state line, but the state logs indicate it exists to the north end of the Clay Wade Bailey. 2) As far as US 52, yes, it joins US 27/127 -- but not until near Exit 3 on I-75 south, which is Hopple Street. Once you turn left on Hopple, you then use a new connector road to get to Central Parkway to go south on US 27/127 and east on 52. So, unless you did that (or followed the reverse on the return trip), you're technically missing a piece of US 52 necessary for a clinch. Awesome pictures. I'm hoping to go to Utah and Nevada next year (2017). 1. Yes, I did cross the river. I went to where US 42/127 split from US 25 in Florence. I did enjoy the area, and I hope I can get back there during the summer to check out a Reds' game. 2. 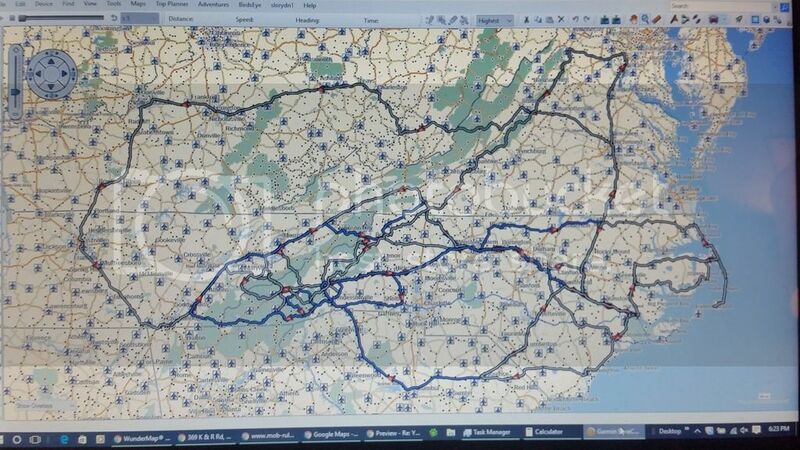 The whole routing of all the US routes there was very confusing. From I-74, US 52 is signed on I-75, but when I got off I-74 to Central Parkway, there were markers for US 27, 52, & 127. I took a different way home so I could see some different scenery. Thank you for clearing up the routing of US 52. Having it signed in conflicting places threw me off. I was born just east of Cincinnati, Williamsburg in Clermont County. Still have a couple of hundred relatives there, seriously. Been to Florence. Very familiar with US 52, man does it ever twist and turn. I haven't clinched it but I have traveled many miles of it. Was on it at the Canadian border in ND and down through MN, a lot in Ohio and Indiana, some in Illinois and Iowa, probably some in Kentucky but not for sure. That would be a fun one to travel from end to end if I had the time. Had a couple of road trips - well I don't know does flying somewhere, then getting in the car over 1000 miles count? We went to the Pacific Northwest on vacation, flying in to PDX and leaving from Seattle. Portland to Eugene out to Florence back to Eugene then back to Portland. Day trip out the Historic Columbia River Gorge highway to Hood River, then around and up Mount Hood and back to Portland. Out to Canon Beach, Seaside, Astoria and Ilwaco, WA - back to Seaside for the night. Left Seaside and up to Mount St Helens followed by a trip through Mount Rainier NP the next day - ending in Seattle and turning the car back in. Loved the Gorge, driving the roads in Rainier was amazing - could not believe the lack of guard rails in some spots. Liked the roads out to the Oregon Coast. Trip 2 back in Indy was out to Newton, Iowa for the Indy Car race and back to Indy - let me clinch I-74. Detours in to Iowa City and Champaign-Urbana for the Big Ten portion of the tour. I'm a big Indy Car fan when it comes to ovals. TK is my favorite driver even though I'm not a big fan of Chip Ganasi. I couldn't care less about the road / street courses. The California 500 race was one of the best races I had seen in a very long time. I go to the Indy 500 every year and sit in Turn 3 NE Vista. I used to go to Joliet when they had races up there. I miss the days of all oval races and 1 or 2 road courses. Indycar ovals are better than Nascar anyday. Had a lot of good road trips last year, but three that stand out. - To Reno and then into the State of Jefferson in early March, perfectly timing a light snowfall. My first time in Ashland, Klamath Falls, Redding and Chico. And I've now almost clinched I-5, CA 99 and US 395. - A trip to visit what I call "Lost California", on the eastern side of the Sierras. Bishop, Mammoth Lakes, a wonderfully preserved ghost town, and the powerful Manzanar National Monument. Bishop has become one of my favorite little towns. - Driving from Baltimore, where my wife had a conference, to Honesdale, PA and onto Milford in order to clinch the modern US 6. Just that last little segment. When I got back from that last trip, my mother-in-law told me this crazy story that I haven't been able to verify, but I don't know why she would lie about it. She saw the picture of the courthouse in Honesdale, and told me that my wife's aunt, whom I've met, was shot there by her estranged husband during a divorce proceeding, and then went on to kill himself. The bullet only grazed her head and she was mostly fine. I wish I had known that story before because I feel like, in a small town, that's not something that's easily forgotten from the collective consciousness, and I could have asked some of the older folks in town. As always for me, it's the northern suburbs of Tampa Bay to Eastern Queens, New York City. And as it has been for the past three trips, I took I-75 towards FL 40 to Marion County Road 314 to FL 19 into Palatka, then to FL 20 to US 17 and north on FL 207 to I-95. On my way there though, I took that detour to US 17 into Charleston, South Carolina so I could take some pictures of the Amtrak station, and I-26 back to I-95, as I had asked about on a previous thread. I also had to stop in Florence to get a new SD card for my camera, because the damn thing was randomly deciding not to recognize the one I had. I stayed in the same cheap motel north of Fayetteville, North Carolina where I saw that gorgeous motel clerk in 2014. I found out she quit, but I didn't let that bother me. However the air conditioner was so cold I had to turn the thing off at 1 in the morning. Also a bunch of kids ripping up the parking lot with motorcycles (or the parking lot of the Exxon station across the street, I really didn't bother to look) woke me up around 2 in the morning. The next day I tried to get a picture of the unopened Spotsylvania VRE station. My screwed up SD card failed me again. I took another detour from the Capital Beltway onto US 50 and tried to rush to Middletown, Delaware without getting a ticket so I could see the extremely limited release movie "A Sort of Homecoming." After that, I just bolted up the Delaware Expressway and New Jersey Turnpike into New York City. While I was there I took subway, train and bus trips into the Bronx, New Rochelle, Hell's Kitchen, Brooklyn and Nassau County, and road trips through both Nassau and Suffolk Counties, including the east end, mainly consisting of the North Fork, Western Hamptons, the Moricheses, and parts of the northern Town of Brookhaven. I'm not sure what else I care to say about this trip. Last year's main (MAINE) attraction was a trip to the northeast. Yes, we ended up at Acadia NP in Maine, which is one of my new favorite places in America. Vallejo, CA to SF, San Luis Obispo, Napa, and Lake Tahoe.